It’s Time To Love Your Smile! EACH SMILE IS beautiful and unique—and so are you! 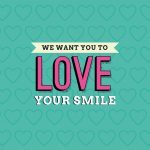 During your next visit, show your smile some love and post a photo on social media and be entered to win a prize! –Step 1: Choose a fun social social sign and take a picture holding the sign. –Step 2: Post the photo to Facebook as a public post and tag the location of our practice. –Step 3: Receive a raffle entry to win $50 off your next visit with us! We have set up a photo booth in our office where you can snap your picture! We will be running this campaign Feb. 1, 2017 – Feb. 28, 2017.